Flying today means less legroom and an even smaller area to store your carryon underneath the seat. 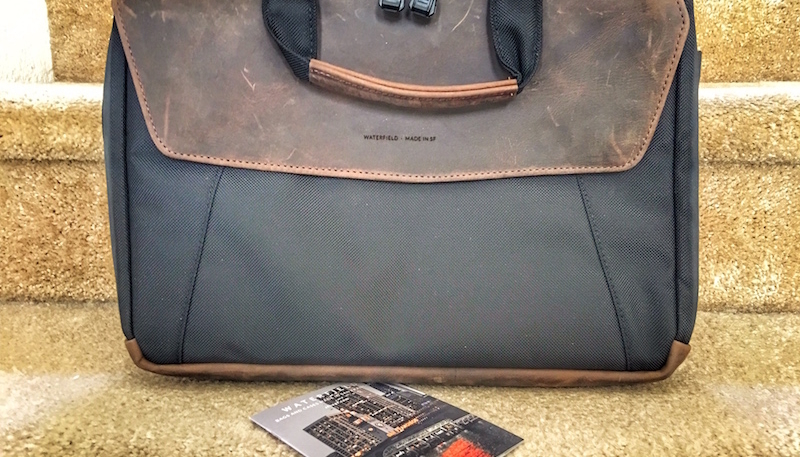 WaterField Designs has taken road warrior feedback and come up with two fine bags that can handle a 15” MacBook Pro and give you precious leg room. They created prototypes and did field research to produce a one-of a kind collaboration with end-users. It is made in San Francisco and should last for many years. From the lining, stitching, ballistic nylon fabric to its front leather flap, it makes a professional style statement. Bags like this are not mass-produced. Artisans, who craft these know that the amount of thought put into its style needs to match the high quality materials used. 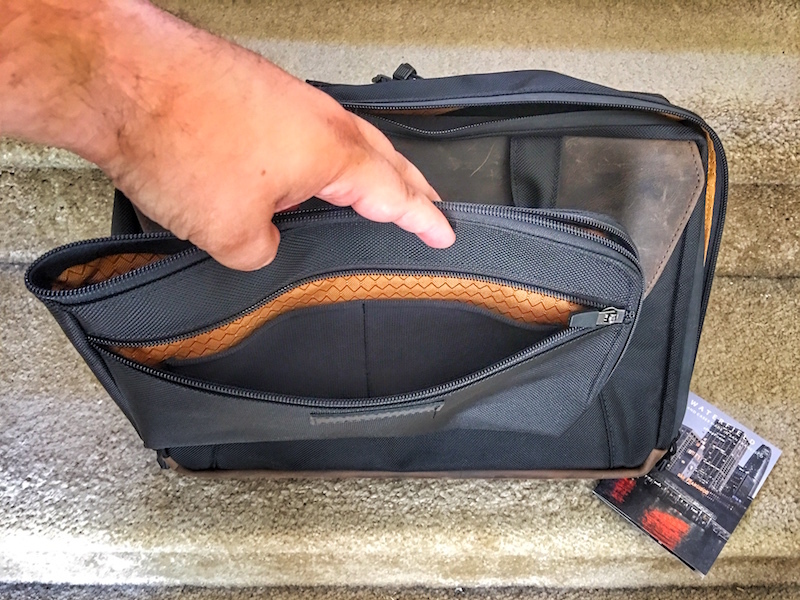 I have reviewed many roller bags, messenger bags and different sizes of carryons, many lacking a most beneficial feature for the road warrior. The Air Porter is designed to fit nicely underneath an airplane or train seat standing up. The Air Caddy is a smaller gear bag with a side to top zipper that makes accessing gadgets while in-flight easier than searching for them in a ginormous catchall, while crouched over during turbulence. 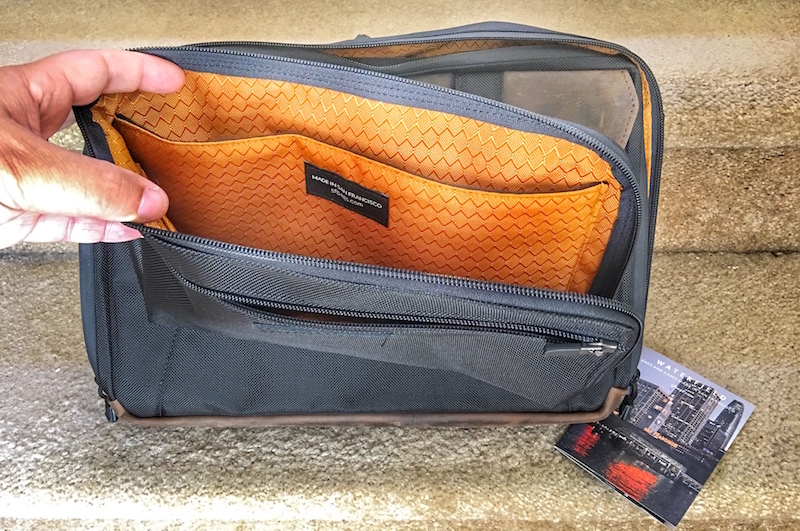 Another zipper on the front of the Air Caddy reveals several mesh elastic pockets to hold wired or wireless earbuds, charging cables, small wall chargers and memory sticks or cards. This bag alone should prevent the loss of a charger, cable or even a smartphone before leaving the flight. Starting from the back of the Air Porter, a large roller bag strap easily accommodates single and dual handle rods. Going inside, you will notice the covered zipper line that can repel liquids. One of my other bags does not have a spill repelling zipper cover. Some Mountain Dew spilled on it and that situation did not end well. 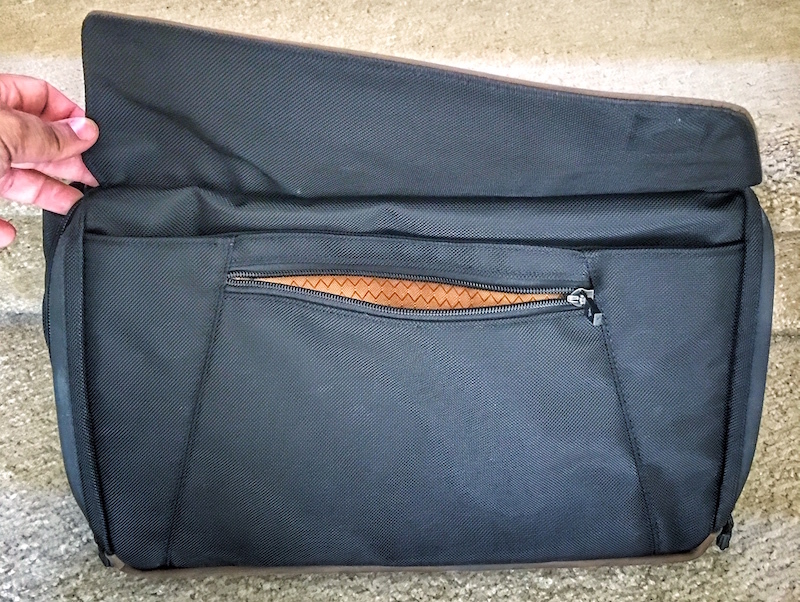 A vertical Velcro strap will keep up to a 15” MacBook Pro secures it in the padded pocket. Its small notch in the padded and suspended pocket allows for a charge and sync cable to be connected to the computer, while in the bag. This part of the bag fully opens to become security friendly. On the flip side, there are two large, deep pockets spanning the entire length and width of the bag. These pockets are good for charger bricks and wall charging cables. On the front of the Air Porter, there are two large magnets holding its fine leather storage flap in place. Underneath the flap are a large pocket and a small pocket with a zipper. I like that the zipper tabs on the Air Porter and Air Caddy lay flat against the zipper line when not in use. This one detail reduces the chance of a zipper scratching or catching on a watch or piece of clothing. Behind the storage flap and two front pockets are three mesh elastic pockets for smaller items. There are three larger pockets beneath them, with the middle pocket being slightly larger than the two on the sides. Finally, there are two pockets on the other side with a cavity big enough to hold some clothes, a wired or wireless over ear headphones and its carry case. My favorite over ear headphones are currently the Monster Elements Rose Gold. Attached to one side is a ring to secure keys inside. 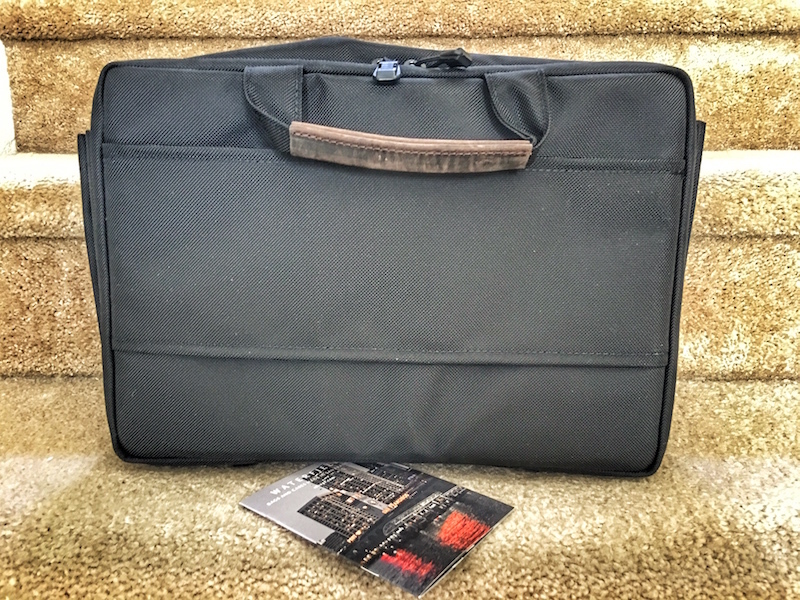 My favorite features of the Air Porter are its notch in the padded laptop pocket; room to nest the Air Caddy bag, spill resistant outer zipper covers, craftsmanship and fine materials used. The gold diamond pattern on its interior fabric is fantastic and carries on in design for their other bags. These luxuries are found on more expensive designer travel bags. It is not enough for a fine carryon to only be stylish or functional. People who travel do not have time to look around inside of a bag for a charging cable and power adapter when taking the middle seat before a flight. 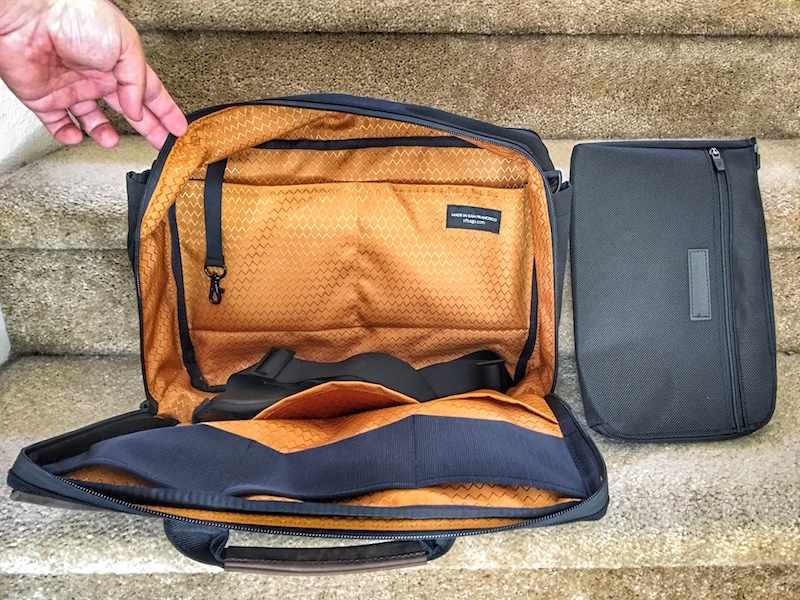 The WaterField Designs Air Porter and Air Caddy, both for $379, combine their design powers, field-testing, craftsmanship and upgraded materials to make your traveling experience better with more legroom. 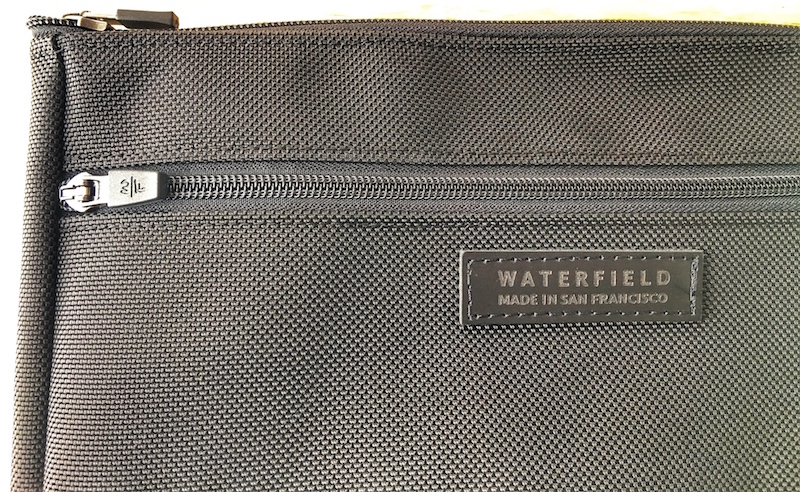 Disclosure: WaterField Designs provided me with an Air Porter and Air Caddy sample at no cost for review. All thoughts and opinions are my own.